The Poydras Center is a sleek, angular glass, class-A office tower strategically located at the intersection of Poydras Street and St. Charles Avenue. 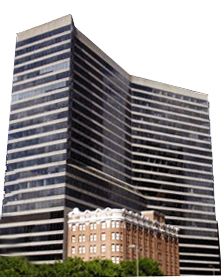 This corner is considered to be “Main and Main” and is the most prestigious and desirable location within the New Orleans central business district. In addition to this favored CBD local, Poydras Center is situated directly adjacent to Lafayette Square Park and its surrounding tree lined streets. With an accomplished on-site management team and principal location, Poydras Center offers even the most discerning tenant the complete package.